My Nissan’s armed with a short change gear box that lets me change up through gears faster off the start line, giving me an edge in acceleration on the car next to me. I’ve equipped a set of brakes that will give me the edge on the Rocky’s tight mountain turns but their added weight will bring down my top speed. The driver in the car over from me has specced out their Subaru for speed so, given the chance, they’ll pull away on the straights. We may not be using gear with names like Speedy Engine of Quickness with a +1 of accelerating but the Crew is as much an RPG as World of Warcraft, with all the character builds, PvP, coop quests, epic raids, factions, and loot that comes with the genre. Ubisoft give us the whole of the United States to drive across, 1,600 square kilometres of land, criss crossed with more than 6,000 kilometres of roads. 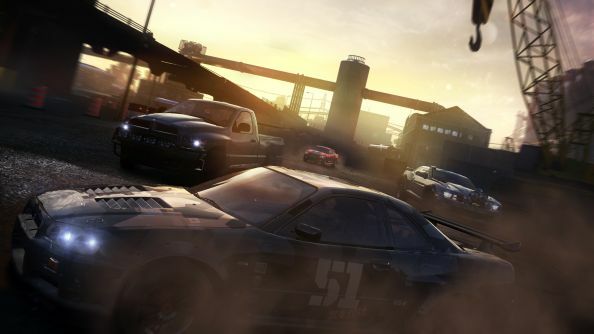 There are more than 60 PvP races, 500 skill missions, hundreds of collectibles, stacks of vehicles, hours of story missions to play through, and a level cap of 50 to hit but The Crew’s creative director, Julian Gerighty, explains that all these numbers are about making a better one. 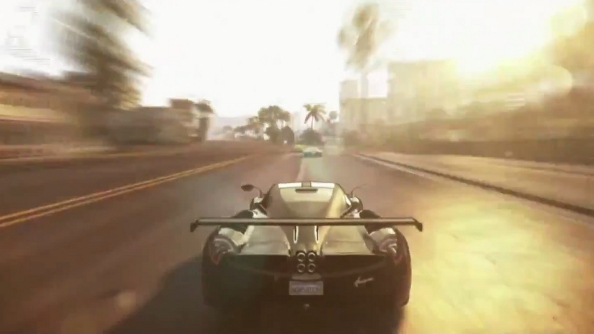 In racing games, he said, “people tend to stick to one car and go through the game investing a lot of time, a lot of energy, and a lot of money into that one car.” Then, when you move onto harder races, you have to abandon it because it can’t compete with the next tier of vehicles. “Unlike other racers where you fill up your garage with 20 vehicles but you’re basically driving that one Subaru, this game lets you stick to that one car.” You can take a humble Ford Focus from the start of the game all the way to level 50 and compete alongside Mustangs and Nissan supercars by speccing it out with high level parts. “Every choice you make and every part you win goes into that car,” Julian explains. “You’ll be looking for those events that reward you that one part you’re missing in your engine that you know is going to increase your performance by x% and will allow you to be more competitive online. 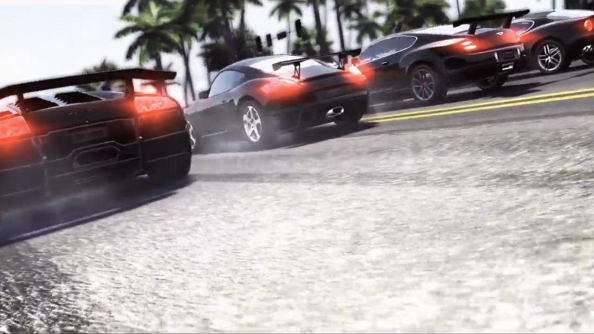 Each car in The Crew is made up of 20 parts, 11 of which effect its performance. Every mission, race, and skill event you complete rewards you with experience, cash, and a part. These parts will have a mix of stats: a powerful engine that buffs your top speed might be very heavy, increasing the time between gear shifts and so decreasing your acceleration, that weight will also put more pressure on the brakes making it handle less well on the corners and increasing your brake distance but, if speed is what you want to focus on, those sacrifices may be worth it. There’s the equivalent of a character sheet where you can see all the parts fitted into your car and what stats they’re effecting. Instead of damage per second and critical hit chance you’re looking at top speed and time for 0 – 60mph. Depending on how well you perform in an event, the part you’re awarded can be bronze, silver, or gold, so you’re encouraged to return to events when you’ve improved your car’s overall performance and recompete to see if you can unlock the gold version of that part. When you get to level 50 all those events become platinum enabled, essentially unlocking the equivalent of legendary parts. Because of the variation in performance that parts afford, two level 50 players could be driving Ford Mustangs fitted out with platinum parts and have them calibrated to two completely different styles of racing: one driver opting for speed, the other for handling, or even a car that’s better offroad so you can take more shortcuts. 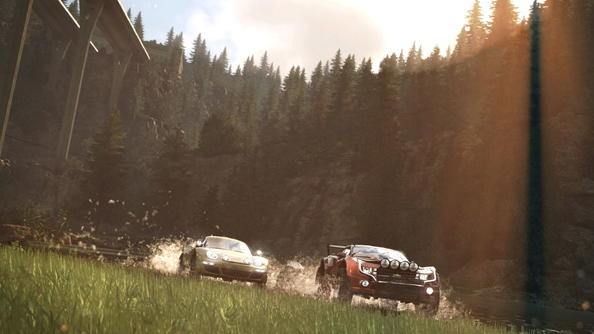 Events in The Crew are split across five different racing specialisations: Street, Dirt, Performance, Raid, and Circuit. Street racing sees you balance speed and handling to out race opponents on tarmac; Dirt’s essentially rally, so racing offroad with a good deal of drifting; performance is Fast & The Furious style road races, so speedy cars, big spoilers, and no grip; Circuit sees you driving around race tracks in a super car; and Raid is true off road, lots of driving across sand dunes, through rivers, and no track in sight. To prove his point about customisation, Julian demonstrated each specialisation by showing a Ford Mustang customised to suit the wildly different requirements of each race type. In street it looked like a standard factory model but in Performance it was fitted with a huge spoiler, multiple exhausts, and slick tyres. And, in the Raid build it looked more like a tank – huge thick tyres, a chunkier body kit, and no spoiler for down force. On top of all those different parts and cars, every vehicle can be tuned, too. You can alter your gear ratio, ride height, and downforce, giving you finer control of your car. Or, you can ignore it entirely and treat The Crew as an arcade racer. I had the chance to play each of The Crew’s specialisations and get a feel for the car’s different handling models. 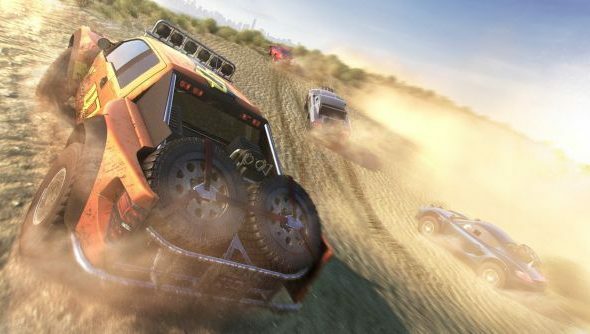 I didn’t dive into the tuning but, even set to the arcade mode, it’s excellent fun to bomb down the Grand Canyon in a Raid car paying no consideration for finesse: the car would cheerfully bounce over dunes and cross streams barely slowing down. The cars in each mode do handle distinctly: when driving in Dirt events my car would slide round corners, barely holding onto the track, whereas in Circuit my Nissan felt like it was glued to road. However, one of The Crew’s disappointments became obvious during Street events. They’re strongly reminiscent of Criterion’s classic, Burnout Paradise but The Crew doesn’t have anything like the same level of destruction. Hit a car at speed in Burnout and you’re treated to a crash cam of both vehicles’ bodywork shredding from the force of the impact. In The Crew crashes reveal a simplistic damage model, you car barely deforms. It’s underwhelming and some times confusing: you can get taken out from (what feels like) the smallest of impacts. Without the detailed damage model you don’t get a sense of the power of the crash. Another weakness is apparent in free ride. 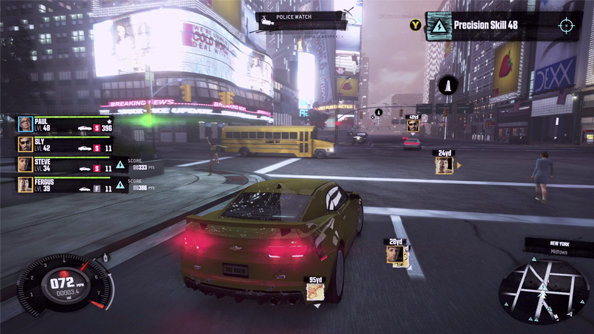 If you crash into enough cars or cause environmental damage you can gain a wanted rating and you’ll be chased by police. 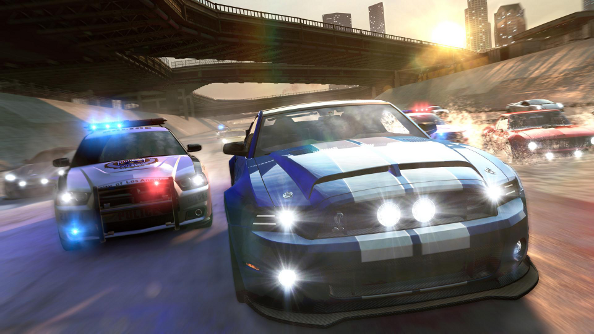 Unlike Need for Speed and GTA where the cities fill with police cars, roadblocks, and helicopters give chase, the police presence in The Crew is minimal. For the amount of work I had to put into getting a wanted rating the payoff was rubbish, one, maybe two squad cars would appear and they were easy to lose. One time, while on the highway, the AI couldn’t seem to get onto the busy road so I lost my rating before they even arrived. If both those elements, destruction and police, were ramped up it could make for a much more exciting world. 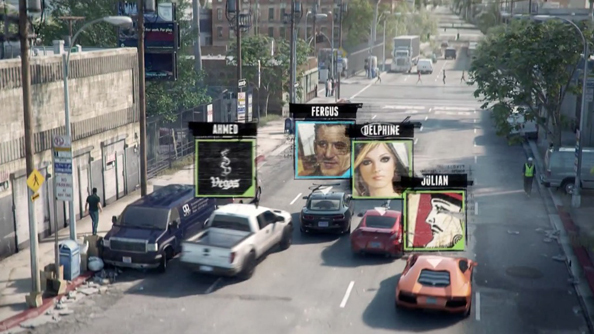 Though, a lot of The Crew’s action may come from elsewhere, its multiplayer. Takedown missions, for instance, work much better in coop. Your aim in takedown is to trash a target car, crashing into it till its health bar falls to zero. If you’re on the open Texan plains in a raid specced Ford pinning your target to crash into them for maximum damage can be a real challenge, you can only manage glancing blows. If you’re doing it in a crew one of your friends can act as a breaker, slowing the target down so you can drive into it at full speed. Larger than crews are Factions. Early in The Crew’s story, within the first couple of hours, you’ll be asked to join either The Wolves or The Eagles. From then on you’ll have access to faction missions that earn you reputation points within your group, which gets you access to cash, and exclusive parts and missions. At the end of each month the faction who gained the most points will receive rewards so there’s a real incentive to take part in the missions and help your group along. The faction missions are the equivalent of The Crew’s raids. Some of them can be short, ten minutes races with other faction members, but some can go as long as four and a half hours. Julian admits that “this kind of race is only for a small percentage of people” but he believes there will be players out there who want to play huge endurance races and the team want to cater to that wish. I can see myself getting deeply drawn into The Crew, spending hours trying to unlock all the parts for the perfect build of my favourite car and I can also see myself convincing my friends to log on every night so we can run races together – not against each other but with each other. It shouldn’t be too difficult to convince them to come to PC either because The Crew’s going to look a hell of a lot better on PC than on consoles: the framerate’s been raised from 30 fps to 60 and Ubisoft have enabled both 4K and triple screen set ups. I’d love to see a greater level of destruction because Burnout Paradise remains one of the most joyous racing games in existence but even without that The Crew’s looking excellent.